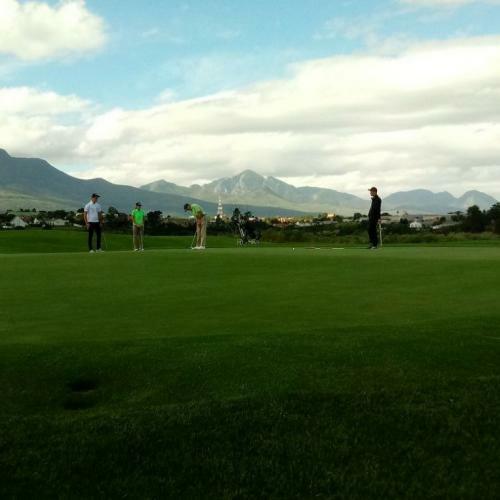 The Western Cape's established golfing culture and mild, temperate climate offers a unique, year-round experience with a proven capability to confidently host major events. Add to this our renowned reputation for hospitality and service and you have the components for a truly world-class golfing destination. 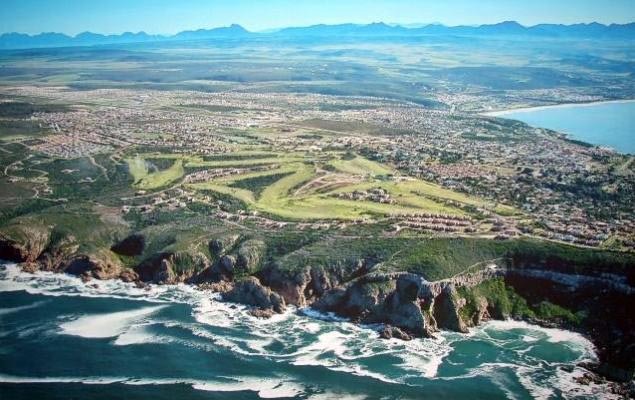 In 2006 the Garden Route was named 2006 Golf Destination of the Year for Africa by the International Association for Golf Tour Operators (IAGTO). Golf tour operators from 38 countries vote for the IAGTO's Golf Destination of the Year awards. The Cape Garden Route is home to the host of the Presidents Cup in 2003, Fancourt Hotel & Country Estate, Goose Valley designed by the Gary Player Group, and Pezula Golf Club. 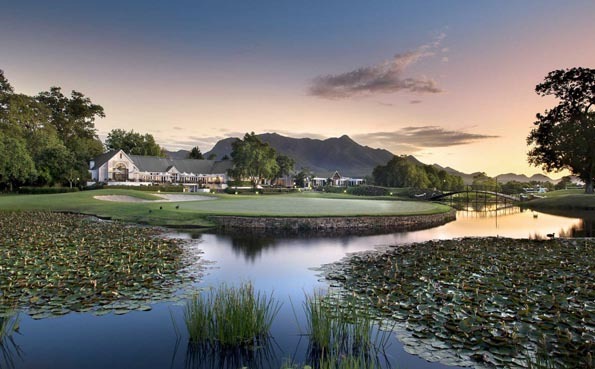 Located on 350 acres of glorious countryside at the foot of the Outeniqua mountains close to George in the Garden route, the Fancourt Hotel and Country Club Estate has four golf courses on offer that meet the exacting requirements of champions as well as the needs of the improving golfer. All the courses are renowned for their amazing year round condition and the attention to detail that is shown. They are the Links, Montague and Outeniqua courses. 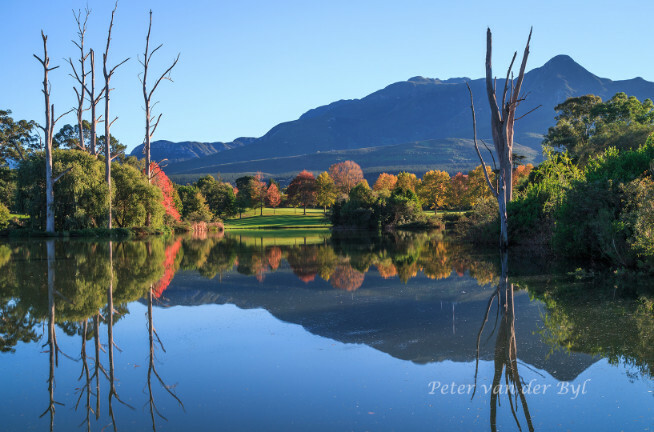 This golf course is among the oldest in the country with its natural beauty, enhanced by lavish flora, well-established trees, large dam and the spectacular back-drop of the Outeniqua Mountain Range. 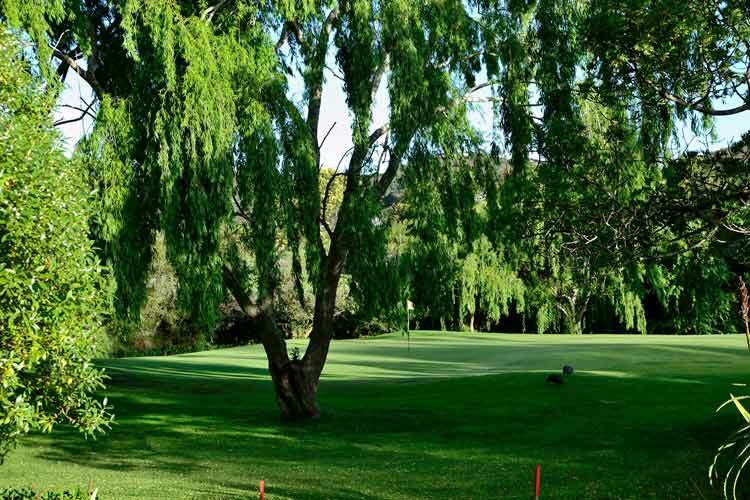 George Country Club has for many years maintained a worthy rating among the top ten golf courses in South Africa and many locals prefer it to Fancourt. 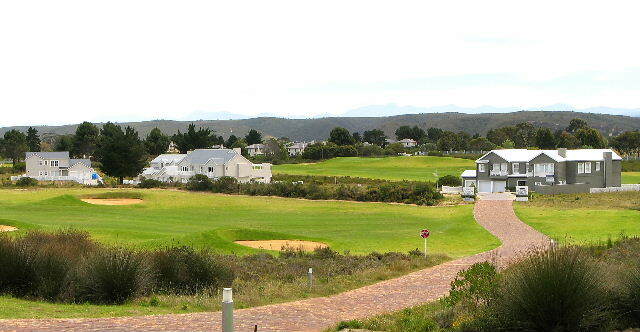 Kingswood Golf Estate is placed between the Fancourt Links and George Golf Course in the heart of the Garden Route's golfing hub. The design, scenery and temperate weather makes Kingswood’s Championship Golf Course a unique challenge. 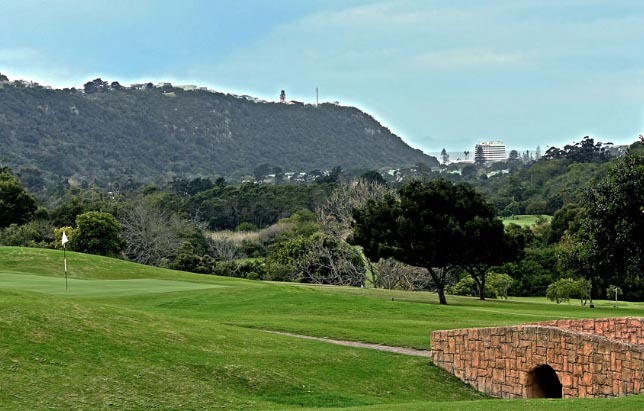 Kingswood is a Sally Little signature golf course designed by Danie Obermeyer, and together they have created a masterpiece of exciting challenges for all golfers. Danie Obermeyer creates his trademark of superb greens that are always a guaranteed talking point on this undulating charming yet challenging layout. This is a superb Gary Player designed 9 hole course, voted number 1 in South Africa, on the banks of the Keurbooms Lagoon, with breathtaking views of the Indian Ocean. The outstanding greens and fairways are a feature of this course, set amongst the indigenous "fynbos" with abundant wild life. Work has already started to extend the course to 18 holes. This very popular holiday course with meandering salt-water marsh hazards and abundant bird life, has magnificent bent-grass greens and views over the lagoon. The course is challenging and the beautiful picturesque surroundings make it an absolute pleasure to play. 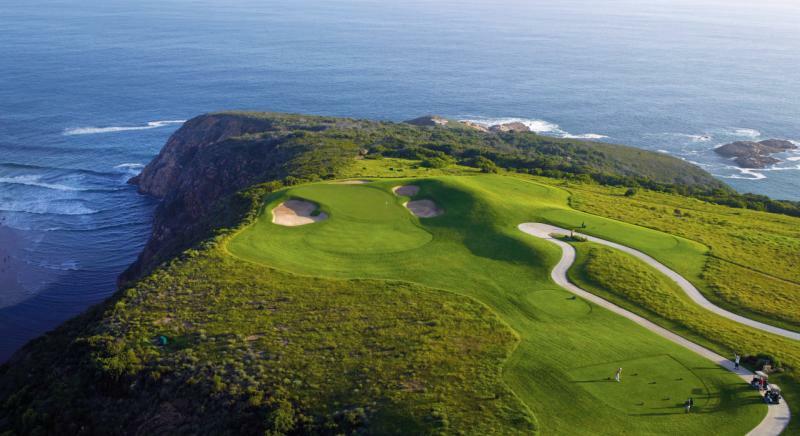 This 18-hole links course is situated above a peninsula that juts out into the Indian Ocean with terrain that is densely vegetated and undulating. The course is a par 72 and is 5880m long with the average size of the bent grass greens being 550m². The climate is Mediterranean with prevailing SE winds in summer and NW in winter. Kikuyu tees and fairways (mixture of Cynoden and Kikuyu) completes the course and ensures the golfer of a wonderful experience where you can see the sea from every tee. 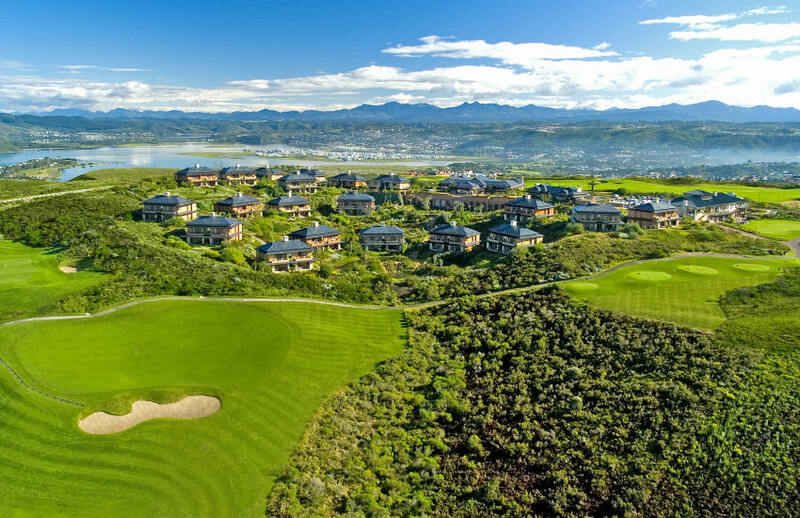 Set on the edge of a magnificent coast, Pinnacle Point Beach and Golf Resort is situated at the gateway to the Garden Route, taking pride of place amongst exclusive neighboring golf courses such as Fancourt, Pezula, Plettenberg Bay and George Golf Club. Uniquely defined by two intimate, secluded beaches along four kilometres of spectacular coastline, Pinnacle Point is located on four hundred hectares of prime land, of which one hundred hectares is nature reserve. The resort is home to indigenous wildlife, birdlife and 264 varieties of fynbos - a nature lover's delight! Situated 8 kilometres from George, this 74 par, 18-hole Championship Golf Course and Driving Range was designed by Ernie Els and his team, and takes full advantage of the spectacular site. The dramatic Golf Clubhouse location overlooks the 16, 17 and 18th greens. Open air terraces offer panoramic views of the Indian Ocean and the Gwaing River Valley. As you walk the course your views and outlooks take in forest, sea, river and mountain. 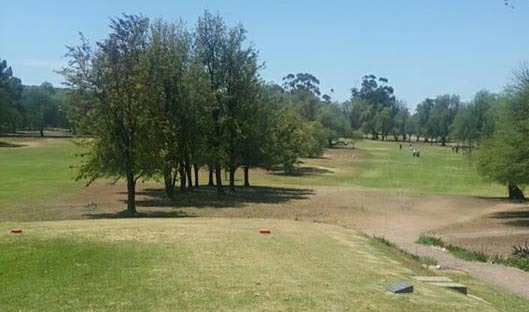 Oudtshoorn Golf Course, situated in the Little Karoo, forms an oasis of green fairways in the dry scrubland that is so characteristic of the area. The course with its par-72, 6 210-metre layout is a challenging and enjoyable one with pepper, palm and blue gum trees lining the fairways. Three large pepper trees adorn the middle of the fairway at the 497-metre, par-five 13th hole. There is also a large dam (part of a nature reserve) to the right of the closely mown area and any tee shot of note must be carefully threaded between the trees and the hazard. This spectacular, manicured golf course, with undulating terrain and magnificent views over the Indian Ocean and Knysna Lagoon, is a must for every golfer. The area is covered with beautiful varieties of "fynbos", which strongly resembles Scottish heather. The course, largely designed by nature with immaculate bent-grass greens, will provide challenges to the expert, yet is accessible to the everyday player. 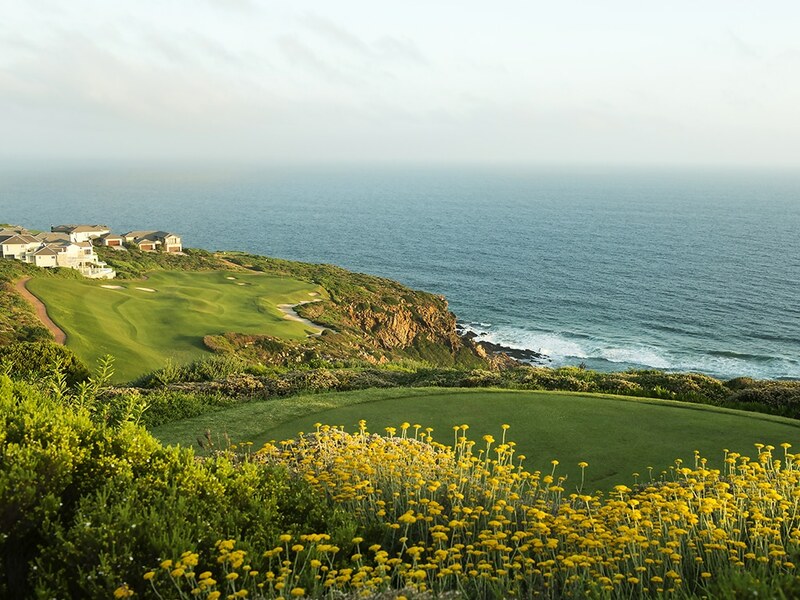 The 14th and 15th holes, which play along the steep cliffs above the Indian Ocean are unmissable experiences. This highly rated undulating course, set in a proclaimed nature reserve in the Piesang Valley, has lush green fairways, a sweeping tree-line and new bent-grass greens. Accuracy is essential for coping with the meandering Piesang River which flows through it. The magnificent 18-hole, 72-par layout is set in the most lovely of settings is rich in bird life and home to the strikingly beautiful Knysna Loerie. All greens and bunkers are to USGA specifications.